NEWSgrist - where spin is art: Climate Change Casino? Senator Edward M. Kennedy has flexed his considerable political muscle to try to block a wind farm in Nantucket Sound. Governor Mitt Romney strongly opposes the project. But how would they handle this? A floating theme park, described by its designer, Provincetown artist Jay Critchley, as ''a Las Vegas version of the Cape and islands," to be built on an enormous triangular platform in the midst of the wind turbines. Some dismiss it as an extravagant -- and expensive -- joke. But Critchley isn't laughing, at least not in public. He says that by proposing the theme park he is trying to bring attention to what he believes is the lack of oversight that the proposed wind farm has received and that he is challenging regulators to give his project similar treatment. 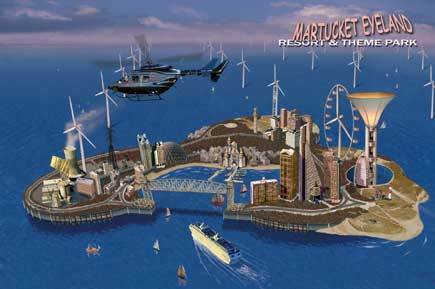 Dreamed up by Critchley, the plans for the Martucket Eyeland Resort & Casino read like classic political satire. Attractions would include the Climate Change Casino & Sweat Lodge, the Captain Ahab Fitness Center, and an amusement park ride called Jaws, Jaws, Jaws, which Critchley describes as ''a simulated eating by a shark -- for the kids." To be taken even remotely seriously, the 59-year-old Cape Cod artist and provocateur has to insist he has every intention of actually building the theme park. And he does insist. He even filed an application in March with the US Army Corps of Engineers, seeking a permit to move forward with construction. According to the application, the platform would be anchored between three of the 130 turbines in Nantucket Sound that would comprise Cape Wind. But in this game of showmanship, federal officials, who admit they were initially amused by Critchley's submission, now caution that the artist is risking serious consequences by forging ahead with his permit request. Applicants found to have knowingly made ''false, fictitious, or fraudulent statements or representations" may be fined $10,000 or imprisoned for up to five years, said Tim Dugan, a spokesman for the Corps' New England district. ''We're working at taxpayers' expense, and we don't want to waste their money," Dugan said with all deliberate earnestness. Critchley said he is not worried about being prosecuted, though some of his friends are concerned. ''I have other things to worry about, like raising a billion and a half dollars to build the park," he said with equal earnestness. Corps officials have conducted an initial review of Critchley's application and have asked him for more information. If he does not reply, a spokesman said, his file will be closed. If he moves the process forward, the Department of Justice could be called in to decide if he applied in good faith. The fate of the Cape Wind farm, while farther along in the planning stage, is still uncertain. Kennedy supported an effort by Senator Ted Stevens, Republican of Alaska, to block the development by inserting a provision in a sure-to-pass bill funding the Coast Guard that would give the governor of Massachusetts the ability to veto the project. But the provision -- inserted without public debate, after being considered by only the handful of House members and senators negotiating the Coast Guard bill -- has rankled members of both parties. A group of House members persuaded House leaders to delay a vote on the bill. In the Senate, the chairman and the ranking Democrat on the Energy Committee say they will try to block the Cape Wind provision when the bill comes to the floor.